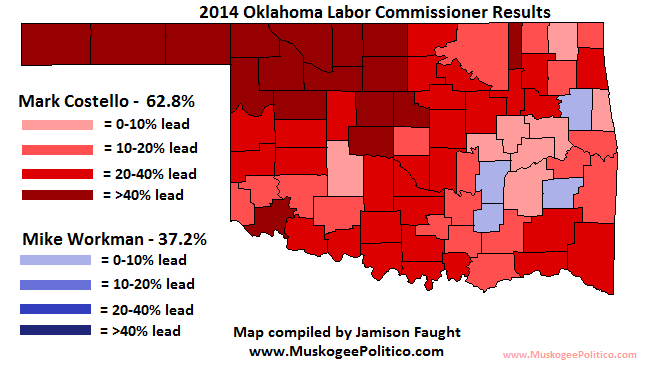 Continuing with my Election Results Maps series, we now come to the race for Labor Commissioner. Incumbent Republican Mark Costello defeated Democrat Mike Workman by an overwhelming 62.8% to 37.2%, a margin of just over 25%. That is just a little less than his 64.2% performance in 2010 against incumbent Democrat Lloyd Fields. Like Fields, Workman beat Costello in four counties, three of which were the same (Cherokee, Coal and Latimer). If Costello's margins had remained the same as 2010 in Oklahoma and Tulsa counties, he would have had almost the exact same percentage as four years ago.